Raccoons are a type of mammal that are native to North America. They are considered a pest as they can destroy lawns, cause damage to property and even carry harmful diseases such as rabies. Apart from visually sighting a raccoon, there are several other ways you can identify them. 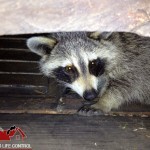 This article takes a look at some of the most common signs of a raccoon infestation, and it also explains what you can do if you think that you have an infestation. One way you can identify a raccoon infestation is by listening out for any unusual noises. These can include scampering, scratching or chattering noises coming from your attic area, or from underneath the home. Noises can indicate that you have a raccoon infestation, but it may also mean that you have another type of infestation, such as a rodent problem. There are several physical signs that a raccoon is living either in or around your property. You can inspect the external area of your home to look for signs of shingles that have been removed from the roof area. You can check for damaged vents around the property, or signs of scratching on boards or vents outside of your home. Also check for garbage that has been scattered from your garbage cans, as raccoons are notorious for doing this. Finally take a look out for any rolled up sod on your lawn area as well as destroyed garden crops. Again these signs may help to indicate that you have an infestation, but they could also mean that you have another type of infestation such as a skunk, squirrel or fox infestation depending on the country or area that you live in. If you have any of the above signs it is worth calling in an infestation specialist. Another way to check for raccoons is to look for signs of raccoon feces or urine either in or around your property. Take a look in areas where raccoons are likely to infest, such as attic spaces, chimneys and vents as well as under your home. If you notice any form of faeces in your home then avoid touching or going near them, as they can often contain harmful bacteria and diseases. Instead call your local infestation team who can remove them quickly and safely. If you are still unsure as to whether you have a raccoon infestation or not then you should call an infestation specialist to come and take a look for you. They will have the skills and expertise to identify whether or not you have a problem, and what they can do to remove the pests. At Sand Wildlife Control we offer a range of services and our professional team are on hand to remove pests in the most humane way possible. We are able to deal with a number of pests including skunks, opossums, pigeons, bats, startling, sparrows and squirrels. You can contact us via our online form on our website, by email or by telephone. Squirrels are a type of rodent that is indigenous to America, Eurasia and Africa. They are a common pest as they can cause problems in and around the home. If you think you have a squirrel infestation then you will need to hire an infestation specialist to come and remove them humanely; failure to do so could result in additional damage to your property and electrical wiring. Squirrels can also transmit a number of diseases which can cause health problems for you and your family. Apart from a visual sighting there are several other ways that you can identify whether you have a problem. This article takes a look at some of the most common signs of a squirrel infestation, plus it also explains what you can do to resolve the problem. You can start by taking a look in areas that squirrels will be likely to live and nest. This includes warm and covered areas, such as in the attic of your home. Take a look for squirrel droppings or urine. The droppings will vary depending on the type of squirrels that live in your area, but squirrel droppings are typically brown, oval-shaped and approximately 1/2 an inch long. If you spot any form of faecal matter then you should avoid touching it, and instead call in some infestation experts who will be able to remove it safely. Listen out for any abnormal noises within your home. Flying squirrels are active during the nighttime, whereas grey squirrels are active during the day. Make note of any chipping or scratching sounds that you can hear. Again this will typically come from warm, dry areas, such as in the attic, in vents or even in the walls of your home. Squirrels are notorious for chewing and gnawing through wood and insulation. Inspect both the interior and exterior of your property for any signs of damage, such as scratch marks or gnawing marks. Keep your eyes out for any greasy marks that are located around these areas too. Also look out for areas where squirrels may have made holes through the walls or insulation in order to create an entrance into your home. If you are still unsure as to whether you have an infestation problem then it is worth hiring in an expert for peace of mind. They will have the tools and expertise to be able to identify any problems that you have and then provide you with a humane solution to eradicate the problem in the best way possible. What may appear to be a squirrel infestation could actually be another form of animal infestation, such as a mouse, rat or even raccoon infestation. At Sande Wildlife Control we have a team of highly qualified experts who are able to serve the Greater Toronto Area. You can contact us via our handy online form, by telephone or by email and we will be happy to answer any questions that you may have or schedule you in for a booking.